You can download Cellular and Molecular Biology of Neuronal Development by Ira B. Black free in pdf format. A central problem in neurobiology concerns mechanisms that generate the pro­ found diversity and specificity of the nervous system. What is the substance of diversification and specificity at the molecular, cellular, and systems levels? 4 How, for example, do 1011 neurons each form approximately 10 interconnec­ tions, allowing normal physiological function? How does disruption of these processes result in human disease? 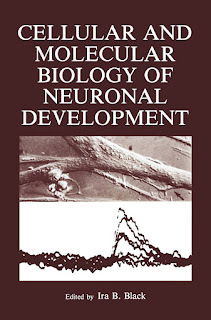 These proceedings represent the efforts of molecular biologists, embryologists, neurobiologists, and clinicians to approach these issues. in this volume are grouped by subject to present the varieties The chapters of methods used to approach each individual area. Section I deals with embry­ ogenesis and morphogenesis of the nervous system. In Chapter 3, Weston and co-workers describe the use of monoclonal antibodies that recognize specific neuronal epitopes (including specific gangliosides) for the purpose of defining heterogeneity in the neural crest, an important model system. Immunocyto­ chemical analysis reveals the existence of distinct sUbpopulations within the crest at extremely early stages; cells express neuronal or glial binding patterns at the time of migration. Consequently, interactions with the environment may select for predetermined populations.